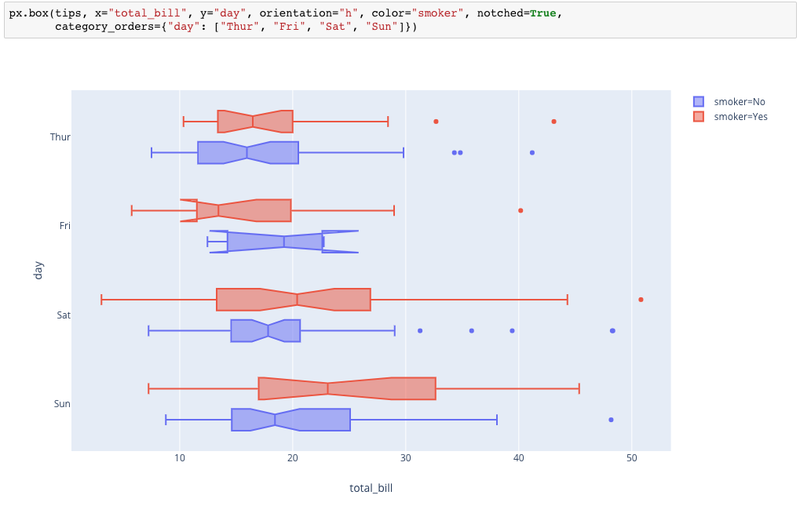 Plotly Express is a new high-level Python visualization library: it’s a wrapper for Plotly.py that exposes a simple syntax for complex charts. 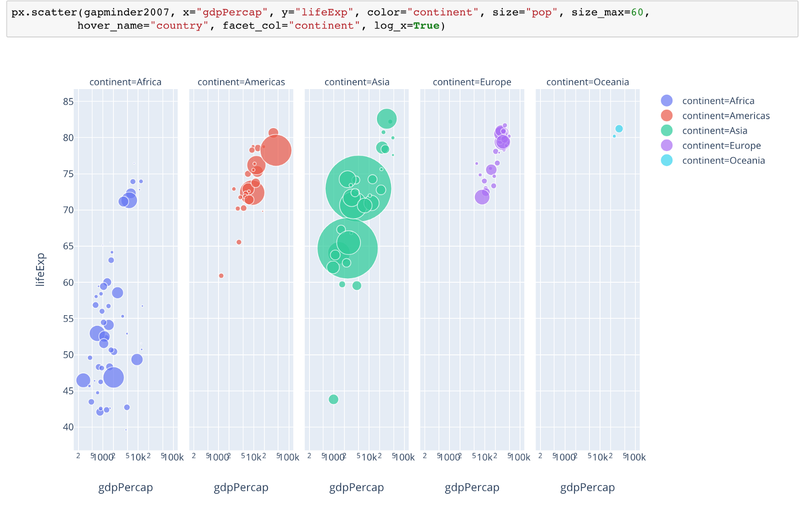 Inspired by Seaborn and ggplot2, it was specifically designed to have a terse, consistent and easy-to-learn API: with just a single import, you can make richly interactive plots in just a single function call, including faceting, maps, animations, and trendlines. It comes with on-board datasets, color scales and themes, and just like Plotly.py, Plotly Express is totally free: with its permissive open-source MIT license, you can use it however you like (yes, even in commercial products!). Best of all, Plotly Express is fully compatible with the rest of Plotly ecosystem: use it in your Dash apps, export your figures to almost any file format using Orca, or edit them in a GUI with the JupyterLab Chart Editor! 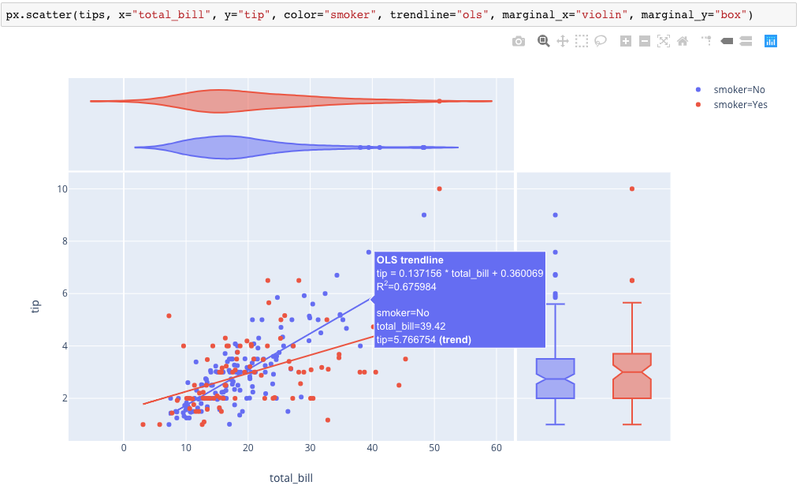 If you’re the TL;DR type, just pip install plotly_express and head on over to our walkthrough notebook or gallery or reference documentation to start playing around, otherwise read on for an overview of what makes Plotly Express special. If you have any feedback or want to check out the code, it’s all up on Github. The code used to generate the screenshots below is available in our walkthrough notebook which you can load up on Binder to play with right now in your browser without installing anything. 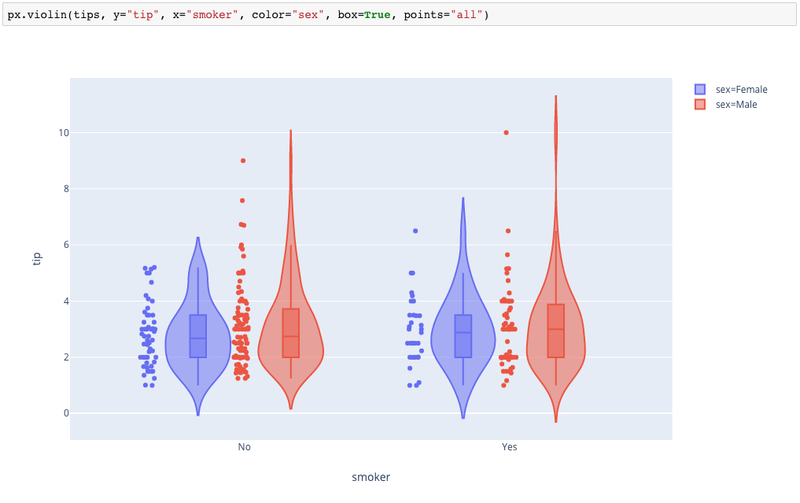 Once you import Plotly Express (usually aspx), most plots are made with just one function call that accepts a tidy Pandas data frame, and a simple description of the plot you want to make. 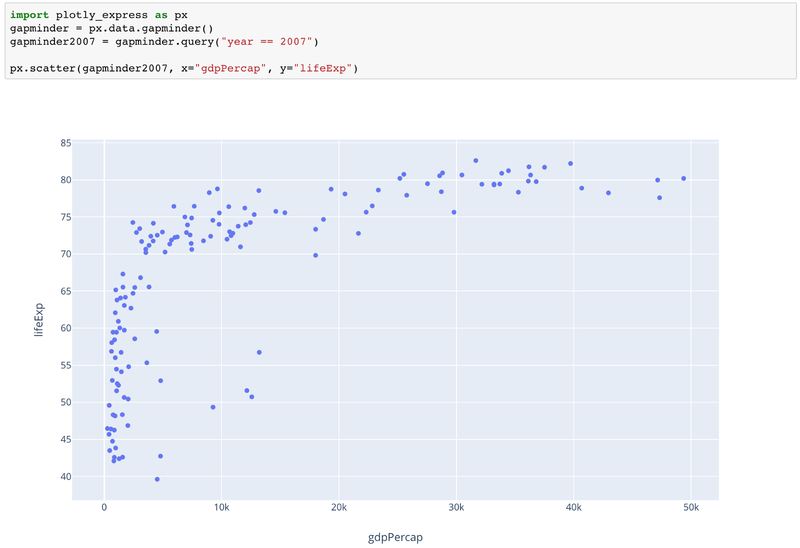 If you want a basic scatter plot, it’s just px.scatter(data, x="column_name", y="column_name"). Try mousing over points, clicking or double-clicking on legend items, or using the “modebar” that appears when you move your mouse into the frame to control the behaviour click-drag interactions (zoom, pan, select). Because this is geographic data, we can also represent it as an animated map, which makes it clear that px can make way more than just scatter plots, and that this dataset is missing data for the former Soviet Union. In fact, Plotly Express supports scatter and line plots in 3d, polar and ternary coordinates, as well as in 2d coordinates and on maps. Bar plots are available in both 2d cartesian and polar flavours, and to visualize distributions, you can use histograms and box or violin plots in univariate settings, or density contours for bivariate distributions. Most 2d cartesian plots accept continuous or categorical data, and automatically handles date/time data as well. Check out our gallery for examples of each of these charts and the one-liners that made them! A major part of data exploration is understanding the distribution of values in a dataset, and how those distributions relate to each other. Plotly Express includes a number of functions to do just that. Box and whisker plots, with optional notches. Violin plots, with optional jittered points and embedded boxes. You can also visualize bivariate distributions with marginal rugs, histograms, boxes or violins, and you can add trendlines too. px even helpfully adds the line’s equation and R² in the hover box for you! It uses statsmodels under the hood to do either Ordinary Least Squares (OLS) regression or Locally Weighted Scatterplot Smoothing (LOWESS). Scatterplot matrices (SPLOMs) allow you to visualize multiple linked scatterplots: every variable in your dataset vs ever other variable. Each row in your dataset appears as a point in each plot. Zoom, pan, select: all the plots are linked! Parallel coordinates allow you to visualize more than 3 continuous variables at once. Each row in your data frame is a line. You can drag dimensions to reorder them and select intersections between ranges of values. Parallel categories are a categorical analogue to parallel coordinates: use them to visualize the relationship between multiple sets of categories in your dataset. 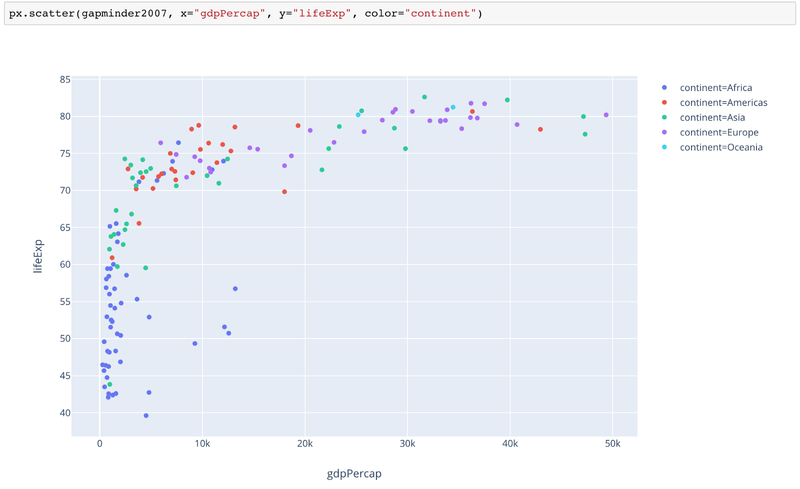 Plotly Express is to Plotly.py what Seaborn is to matplotlib: a high-level wrapper that allows you to quickly create figures, and then use the power of the underlying API and ecosystem to make modifications afterwards. In the case of the Plotly ecosystem, this means that once you’ve created a figure with Plotly Express, you can use Themes, imperatively edit it using FigureWidgets, export it to almost any file format using Orca, or edit it in our GUI JupyterLab Chart Editor. 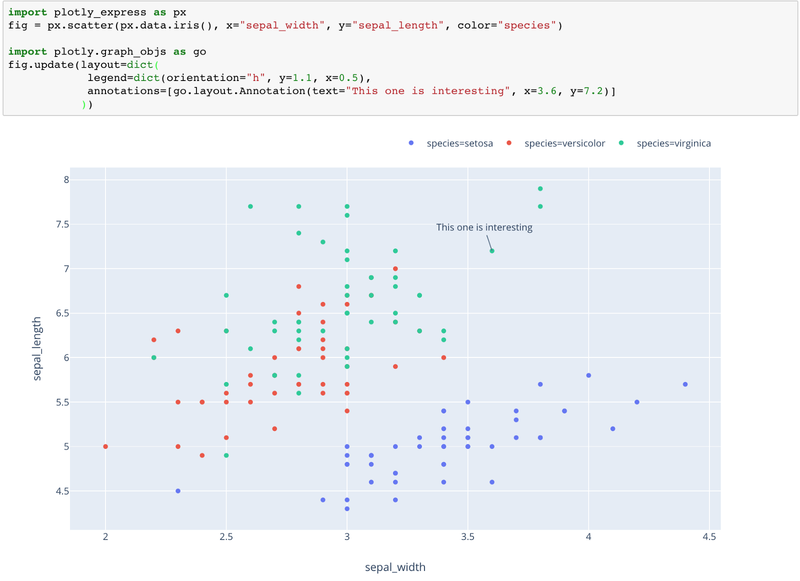 Here we use Plotly.py’s API to change some legend settings and add an annotation, after using Plotly Express to generate the original figure. There are many reasons to visualize data: sometimes you want to present some idea or result and you want to exert a lot of control over every aspect of your chart, and sometimes you want to quickly see the relationship between two variables. This is the communication-vs-exploration spectrum. Plotly.py has grown into a very powerful tool for the communication use-case: it lets you control almost every aspect of a figure, from the placement of the legend to the length of the tick-marks. The cost of this control, unfortunately, is verbosity: it can sometimes take many lines of Python to produce figures with Plotly.py. We wanted to build a library that made a different set of tradeoffs: sacrificing some measure of control early in the visualization process in exchange for a less verbose API, one that allows you to make a wide variety of figures in a single line of Python. 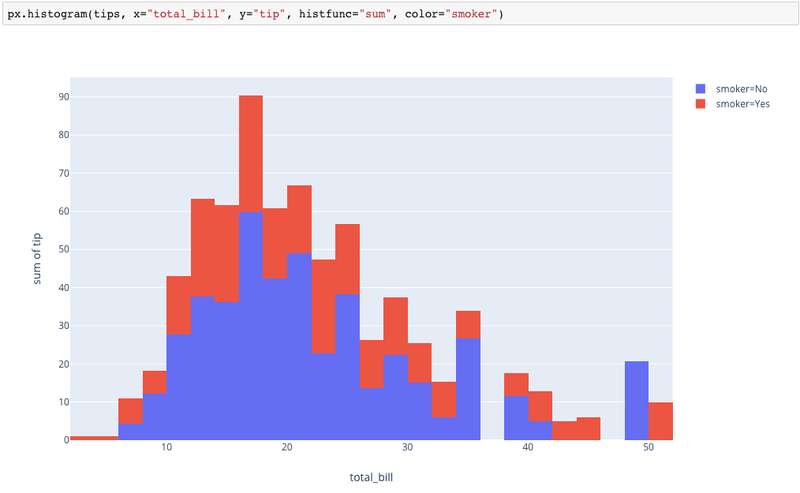 As we showed above, however, that control isn’t gone: you can still use the underlying Plotly.py API to tweak and polish the figures made with Plotly Express. One of the main design decisions that enables such a terse API is that all px functions accept a “tidy” data frame as input. Every Plotly Express function embodies a crisp mapping of data frame rows to individual or grouped visual marks, and has a Grammar of Graphics-inspired signature that lets you directly map these marks’ visual variables like x- or y-position, color, size, facet-column or even animation-frame to columns in your data frame. When you type px.scatter(data, x='col1', y='col2'), Plotly Express creates a little symbol mark for each row in your data frame – that’s what px.scatter does — and maps the values from the column called "col1" to the x-position of the mark (and similarly for the y-position). 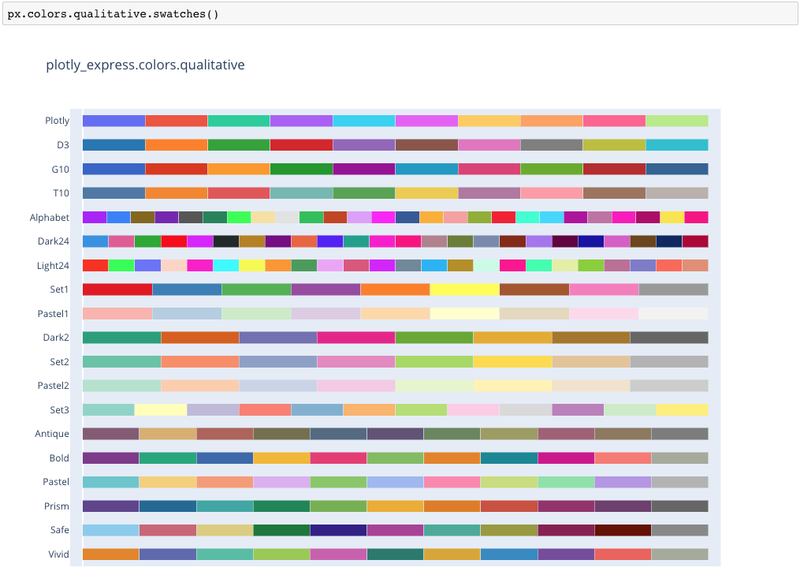 The power of this approach is that it treats all visual variables the same way: you can map a data frame column to color, then change your mind and map it to size, or to a facet-row just as easily by changing the argument. Accepting whole tidy data frames plus column names as input (as opposed to, say, raw numpy vectors) also allows px to save you a lot of keystrokes because since it knows the names of your columns, it can generate all the Plotly.py configuration to label your legend entries, axes, hover boxes, facets and even animation frames. As mentioned above, though, if your data frame columns are awkwardly-named, you can tell px to substitute nicer ones with the labels argument to every function. The final advantage conferred by accepting only tidy input is that it supports rapid iteration more directly: you tidy your data set once, and from there on in you can create dozens of different types of figures with px: visualize multiple dimensions in a SPLOM, with parallel coordinates, on a map, in 2d, ternary polar or 3d coordinates, all without reshaping your data! We haven’t sacrificed all aspects of control in the name of expediency, we’ve just focused on the types of control you want to exert in the exploration phase of a data visualization process. You can use the category_orders argument to most functions to tell px that your categorical data “good”, “better”, “best” has a non-alphabetic order that matters, and it will be used in categorical axes, facet and legend orderings. You can use the color_discrete_map (and other *_map args) to pin specific colors to specific data values if that’s meaningful to your use-case. 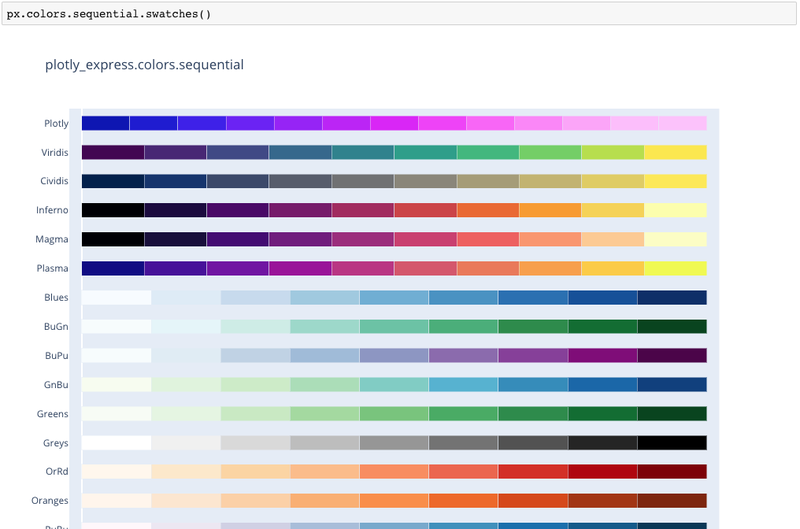 And of course, you can override the color_discrete_sequence or color_continuous_scale (and other *_sequence args) everywhere. At the API level, we’ve put a lot of work into px to make sure all the arguments are named so as to maximize discoverability as you type: all scatter-like functions start with “scatter” (e.g. scatter_polar, scatter_ternary) so you can discover them via auto-completion. We opted to split these different scatter functions up so each of them would accept a tailored set of keyword arguments, particular to their coordinate system. That said, sets of functions which share a coordinate system (e.g. scatter, line & bar, or scatter_polar, line_polar & bar_polar) also have arguments which behave identically, to maximize ease of learning. 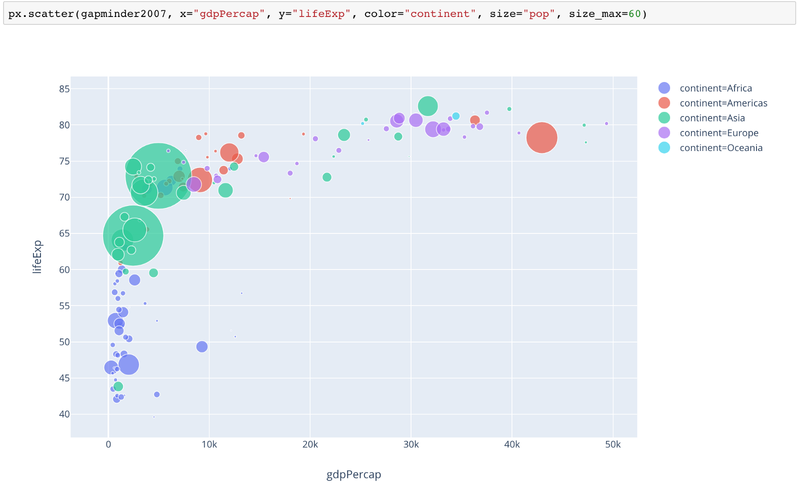 We’ve also put a lot of effort into coming up with short and expressive names that map well onto the underlying Plotly.py attributes, to ease the transition into communication-oriented figure tweaking later in your workflow. Finally, we should note: Plotly Express is ready for release today, but it’s not finished! We want to extend faceting to all coordinate systems, add the ability to compose various px-generated figures together, complete our coverage of Plotly.py trace-types and more! Once we’re done, Plotly Express will get rolled in to Plotly.py version 4 (when it comes out this summer) as plotly.express, although it will remain available as plotly_express as well, so don’t hesitate to start using it as a standalone library today! To use Plotly Express right now, just pip install plotly_express and head on over to our documentation pages for some copy-paste-able examples. Feel free to star and watch our Github repo to get notified of new releases. Speaking of the Github repo, if you have feedback on this library, find a bug or just want some help, please open an issue and we’ll try to help you out!